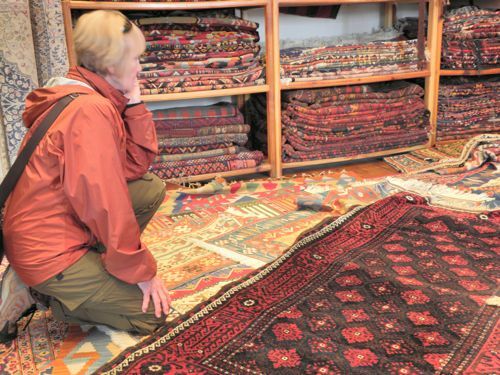 They’d have to try a carpet shop, and then there’s the Grand Bazaar, and of course a Bosphorus tour. Can’t forget the Blue Mosque… Oh! The food! Which dishes will best represent the delectable Turkish cuisine? And what else might wow them? 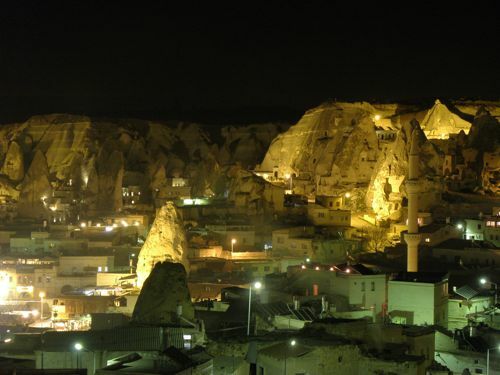 Cappadocia! Yes! Flights arrived on time, and our two taxis (3 ladies each) caravanned to their 2-bedroom Sultanahmet apartment (thanks to Musa Başaran). First stop: The Grand Bazaar, with a quick stop at a carpet dealer’s to finalize arrangements for an upcoming rug show. Oops! Looks like we got hooked into a full-fledged complimentary demonstration. Interesting to all, including two rounds of tea. No sales, though. My friends were hesitant to make decisions on jet-lagged brains. Wise move. Our first meal was a traditional Turkish one at the Doy Doy; mercimek soup, meze plates, and a shared mixed grill left us all grinning (and full). Karen’s constant YUM’s assured me that food would be a highlight of everyone’s week. The next morning dawned drizzly, so we scrapped our outdoor touring plans and headed for the Grand Bazaar, this time, without detours. After fighting with a few cash machines, I showed them some of the hans, and we just wandered around and waited for each other to make purchases. 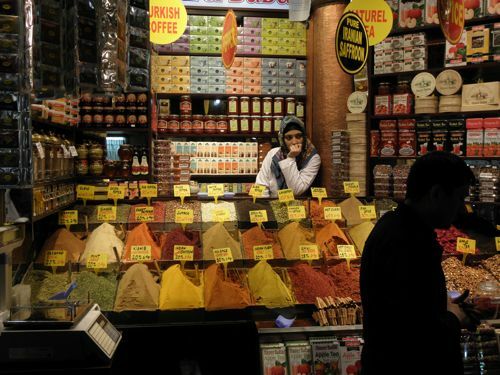 There’s something for everyone in the Grand Bazaar—heck, with 4000 stores, there should be! After lunch we trekked to Arnavutköy for a visit to my little apartment, a tour of Robert College, and a night of jazz on the Bosphorus (my second round of Balık Ekmek Caz). The music was fabulous, and the Ladytrippers (yes, our group even has a name) were more than impressed with the evening-lit Bosphorus. No surprise. It’s always stunning. Day two we headed to the Taş Han and Laleli Mosque. The focus was actually the leather bazaar under the mosque, where everyone wanted to try on pieced leather jackets like one I’d bought years ago. 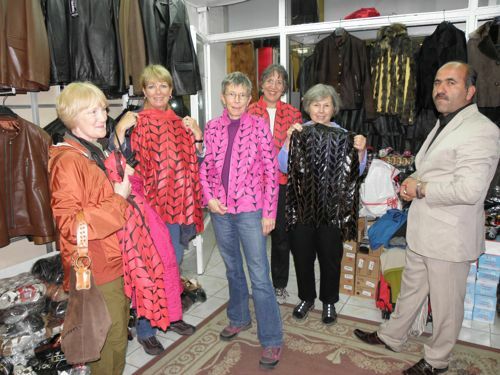 The shopowner was pleased to unload four jackets on our little group, though not quite as pleased as the buyers. The Taş Han was a hit, too. It’s the most meticulously renovated han in Istanbul. Unfortunately, our trekking was a bit limited by infuriating infirmities, which brought back memories of a long-past canoe trip (20 years ago?). We were camped on Peter Lake one hot July afternoon, lounging on massive shoreline boulders as we dangled our feet in the water and chatted. It was just too dang hot to paddle that day. We joked about future canoe trips—being airlifted in to the Boundary Waters with our walkers and wobbling around an island campsite. Sadly, we’re getting there. Our ages now range from 58 to 69, and some of us are showing a little wear. 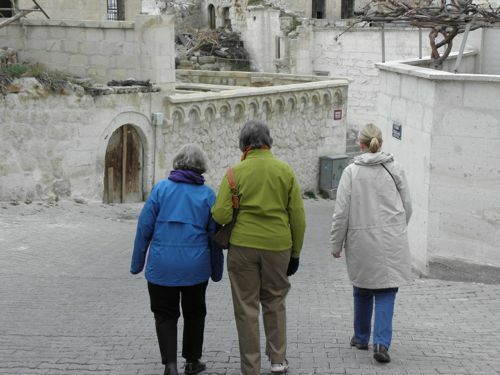 My activity was limited by a recent back surgery, Linda was still recovering from a serious head injury (often dizzy, especially after tram rides), and Gail’s bum knee got so bad she had to buy a cane. What a crew! Those walkers might be in the nearer future than we thought! Oh, well. We did great in spite of our limitations—smiling all the way. 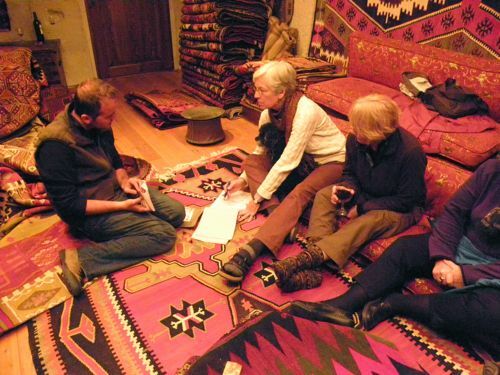 Thursday night we boarded a plane for Cappadocia—what trusting friends I have! Libby was more than pleased to join us, riding in her rolling case like a perfect little princess. The only thing she hates is the security check. I have to drag her through the x-ray machine. No dummy, she. Most of the security guards make a big fuss over her, though one in Kayseri jumped nearly out of her skin when she spotted my dog. 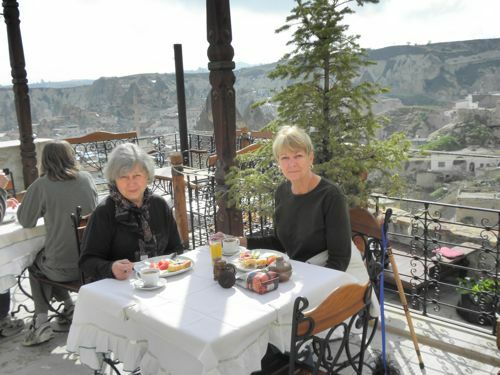 JoAnn and Gail enjoy breakfast on the Kelebek terrace. 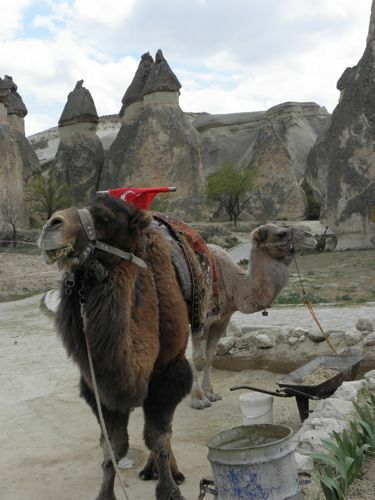 Cappadocia was a hit with everyone. The Kelebek Hotel is incredibly charming, and the first night we were invited by Mehmet Bey for dinner and wine at Sultan’s Carpets. 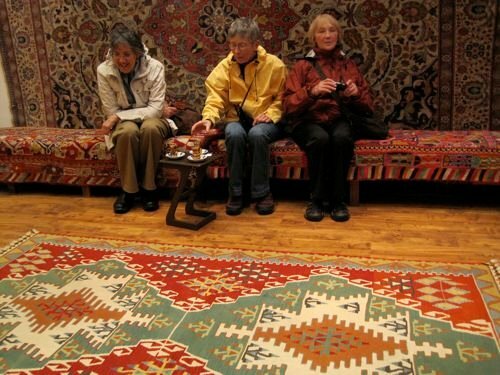 Dinner was a delicious guveç, and carpets were purchased by all. 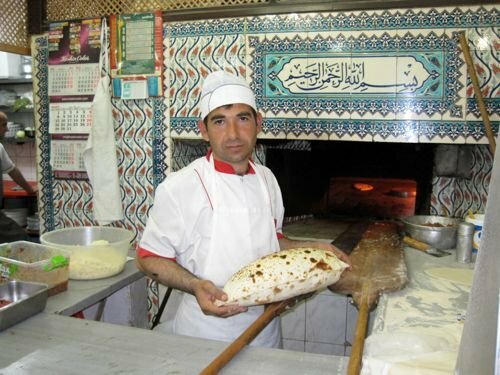 Ali said he made the guveç himself; handsome young fellow and a master chef to boot! …and finally made the plunge (even me). 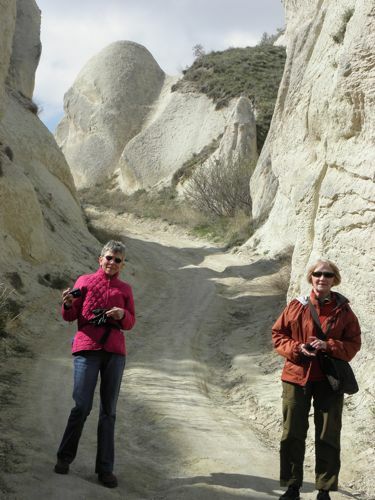 The next day we did a bus tour, including a hike through the stunning terrain of the Rose Valley, a visit to a ceramics workshop, a walk through Paşabahçe’s amazing fairy chimneys, a traditional lunch, and a tour of the underground city. Whew! A VERY full day. 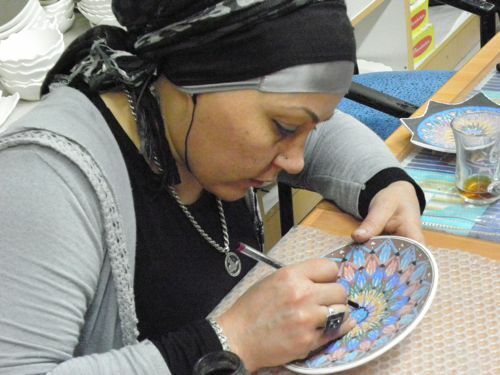 Fine detail painting at the ceramics workshop. 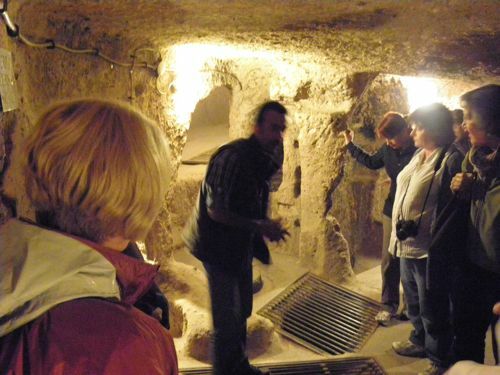 We finished our tour with a stop at Kocabağ winery, then dragged ourselves home. Linda and I were excited to be moving to another room (our first one was charming but tiny). 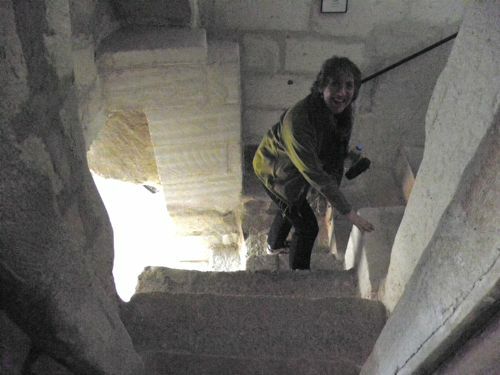 Little did we know we’d be navigating ten knee-high stairs to a little aerie (remember Linda’s dizziness?). 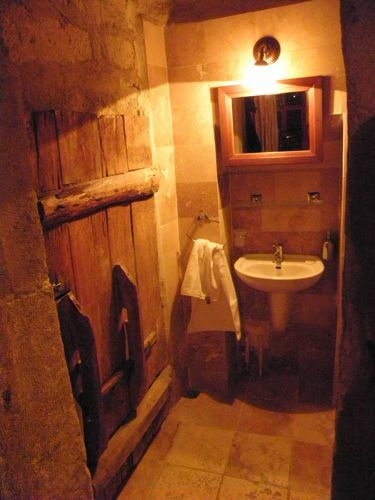 Our antique door locked with a wooden bolt and padlock, and the entryway was also our bathroom! Go figure. Nonetheless, it had charm—and a little more space than our first room. Once we got up there, that is. Get a load of that old door–and the bathroom entryway! But what a sweet room! 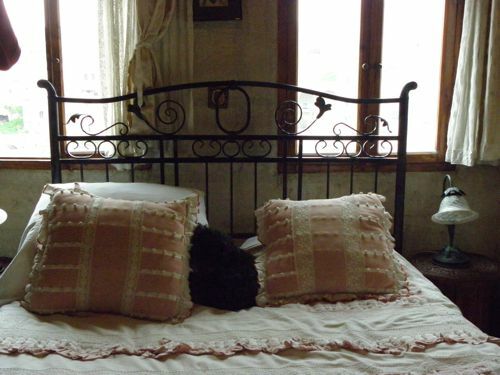 Libby loved all the pillows. Our last day was rainy again, and we explored the town of Göreme, including a weaving workshop and carpet store now run by the government. It was fascinating. It was a low-key day, and I think we all finally relaxed. Then—back to Istanbul, work, and evenings out together before everyone left on Wednesday. I enjoyed sharing Turkey with some of my best buddies, but even more, I loved the time with my bosom buddies. Though only a few of us still have the energy to canoe, the camaraderie endures. We’ve decided to make a slight change: now the Ladytrippers’ annual trek will be to a hotel rather than a campsite. I was born nearly two weeks after my mother’s due date. When my grandmother told her employer my mother’s due date, the employer told her to tell my mother to hang on to me until her birthday, December 13th. My mother said, “Oh, no.” I could go another two weeks. I was due November 25th. “Have her on my birthday, the 13th of December, and she will be one lucky girl,” the woman said. I came on December 13th. I have been very fortunate in this life. It has been a life of incredible opportunity and joy. My friendship with Shelley and the opportunity to travel with her to visit her friend, Ann, continues to confirm the prediction about my birth date. 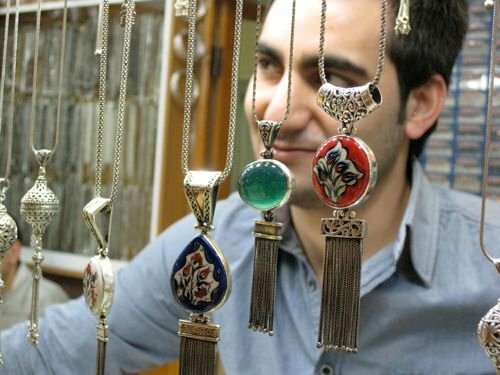 To see Istanbul through the eyes of someone like Ann is not something I even hoped to have happen to me. What a beautiful experience. Ann and Libby are gracious hosts. Well, you could have fooled me! You all look FANTASTIC. And, you are so lucky to have had such close friends for so long. Karen looks exactly the same as when she taught me Spanish!!! Lovely… It felt like I was there too. 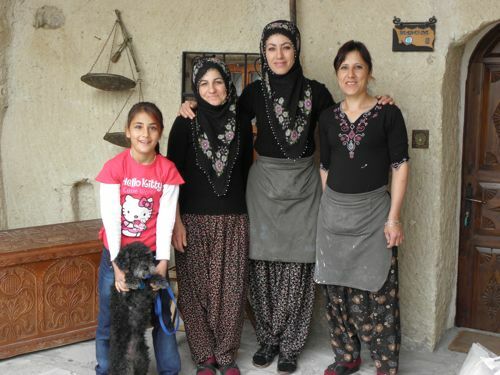 JoAnn told me that the trip you made to Turkey was wonderful! I called her back immediately and said, “Laura…I KNOW Stephanie Odegard.” She couldn’t believe her ears!!! How funny is THAT!!! You all are so very lucky to have this wonderful LOOOONG friendship–you all look absolutely GREAT!!! Your pictures made my day!